The filing Scott turned in last month shows that his net worth last Dec. 31 was nearly $83.8 million, a drop of nearly 19 percent since 2011, and almost all of it stored in a blind trust with assets shielded from public view. File photo: Florida Gov. Rick Scott speaks to the media during a visit to Advanced Pharma in February. Floridians had access to more information about Gov. Rick Scott's substantial wealth when he was a candidate three years ago than they do now. Florida Gov. 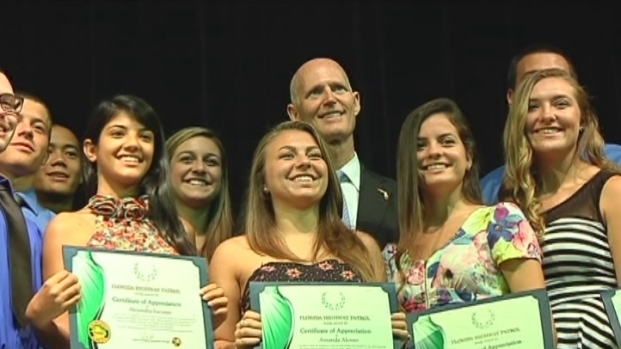 Rick Scott made a very special visit to 21 Western High School students on Monday to recognize them for being prom night heroes. Scott spoke at the event, while Peter Kim, Ashley Wolf and Danny Izzy talked about how it felt to be recognized. In many ways, Florida has never had a governor like Scott. His wealth is far greater than that of previous governors — including Jeb Bush, who had been a successful businessman before entering politics. Scott is refusing his $130,000 salary, as his trust paid him $3.1 million last year. He uses his family's personal jet to fly around the state, saving taxpayers the expense.